(Trent Nelson | The Salt Lake Tribune) University of Utah gymnast Karl Lee, Wednesday Jan. 2, 2019. 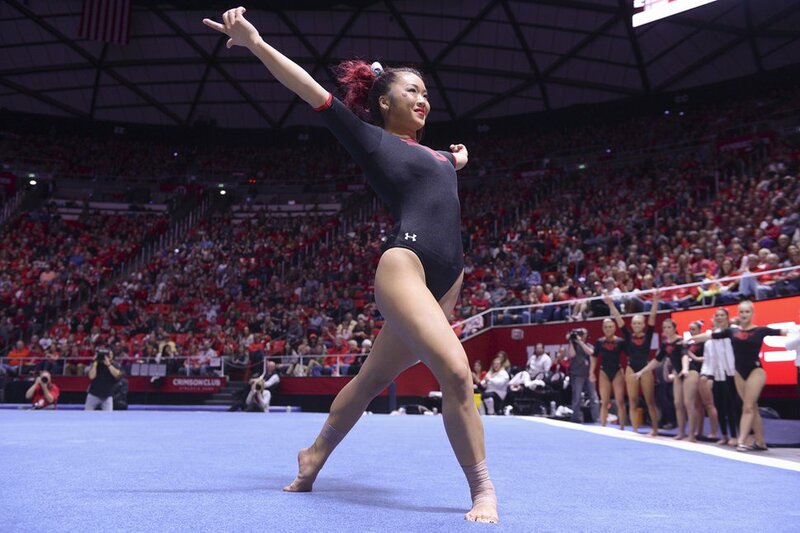 As a fifth-year senior, Kari Lee has been dubbed the ‘grandma,’ on Utah’s gymnastics team. But she is working on earning another nickname too — entrepreneur. Lee, who redshirted her sophomore year after tearing her achilles tendon, is majoring in business administration, with the goal of joining her parents in the family business of owning gymnastics facilities. The family has two sites for Flames Gymnastics Academy in Arizona with three of Lee’s siblings also involved. Lee might think of herself as a coach in the future, but in reality she already has slipped into that role for the fifth-ranked Utes, who open the season Saturday against Penn State at 4 p.m. Being a sort of coach on the floor is one thing, but it isn’t that Lee has embraced that role because she is no longer competitive and was just looking for a way to help the team. If anything, she is better than ever, a feat that is rare for gymnasts going into their fifth years due to the hard nature of the sport that favors youth over longevity. Of note: Three-time All-American and All-Pac-12 Conference..Co-captain…Went all-around in 10 meets as a junior…Hit 49-of-51 routines in 2018 and earned a career all-around high of 39.525 against Georgia…Had four victories…Athletic Director’s Honor Roll. Along with MyKayla Skinner, MaKenna Merrell-Giles and Missy Reinstadtler, Lee forms the heart of the team that is expected to contribute in the all-around in many events. Getting back to the all-around level was a goal of Lee’s in 2018 as she continued to find the form she had before tearing her Achilles and suffering a high ankle sprain at the end of the 2017 season. She was successful in doing so, competing in the all-around 10 times. However, the NCAA Championships didn’t go the way she had envisioned as the Utes finished just fifth. Lee had a 9.8 or higher on every event, but the Utes had too many mistakes elsewhere. Finishing her career with a good showing is important to he, but rather than focus on the end, the Utes need to focus on getting better with every meet, she said. That quest starts against the Nittany Lions. (Leah Hogsten | The Salt Lake Tribune) Kari Lee performs her floor routine as Utah hosts Arizona State in Women's Gymnastics at Jon M. Huntsman Center, Friday, February 9, 2018. Since she made entered the preseason healthier than she has in several years, Lee was able to focus more on improving than recovering. She has excelled on the balance beam and floor with her clean lines and showmanship but has been working to improve her bars and vault. On the latter she has gotten more height and distance under the guidance of assistant coach Robert Ladanyi. Lee said the season opener had caught her by surprise, not realizing it was meet week until she saw several members of the media at practice this week. But don’t worry, according to Marsden, the super grandma senior is more than ready. Of note: Utah has won the lsat 26 meetings with Penn State, dating back to a 1981 loss in University Park, Pa….Penn State is coached by Sarah (Shire) Brown, who competed for Utah’s 2007 NCAA runner-up team as a freshman. She finished her career at Missouri and is in her second year coaching the Nittany Lions…The meet is themed the SLC edition and car decals with the Salt Lake City skyline will be handed out while the team will wear SLC-themed leotards…The Utes will have an autograph session following the meet.